The Commander 2018 product launches in just a few days (on August 10th) and though I’ve already talked about the spoilers and how much I wasn’t all that impressed, upon further review I have found some decks to build out of the precons anyway. My roommate and I were discussing the possibility of going in on the complete set of four decks together and then splitting that in half. While we were both initially most interested in the Lord Windgrace (Jund Lands-Matter) deck we ended up agreeing on how to split up the four pack — I would take Bant Enchantments and Esper Top-Deck while he takes the Izzet Artifacts and Jund Lands Matter decks. As such, I have started to thoroughly look at the deck lists and since I’ve had a little time off of work I was able to brew up something out of each of the precons. Generally speaking, the Ninjas we have here are pretty good. Most are a reasonable CMC while having ninjutsu. Some will help me to remove other creatures, some will cause opponents to discard, and one in particular can become a copy of something else while remaining a ninja. As you can see though, there are only 10 ninjas here, 11 if you count our commander. That’s not enough for a tribal deck, but our commander really wants you to do damage with Ninjas, so I’ve included three cards to help with this. Conspiracy, Xenograft and Arcane Adaption will make all of your creatures Ninjas, and that’s a lesson learned from my Reaper King deck that would not function without them, as most of the scarecrows out there were garbage. There aren’t ways to tutor enchantments in dimir colors outside of the normal expensive black tutors, so we’re hoping for one in our opening hand or while drawing cards through the game. 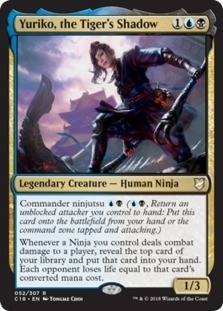 Not only do we want all of our creatures to be Ninjas, but we also need to get some sort of evasion so we can do the combat damage to opponents and bring more Ninjas in with ninjutsu, or just so we can trigger Yuriko’s ability, so let’s look at how we can do just that. Sensei’s Divining Top is the penultimate card for doing these sorts of shenanigans. It allows you to brainstorm for a colorless mana at any point in time. Otherwise, there are poor man versions in Crystal Ball and Seer’s Lantern. In spell form, we can Brainstorm, Ponder, Portent and Dream Cache. Viscera Seer can let us Scry for sacrificing a creature, and in the right circumstances we’ll want to do so (Having an Oversold Cemetary that will bring the creature back, or having Grave Pact out will give you some benefits from your own sacrifice). There are also a couple of scry lands included that can help in a pinch. We want to mess with our top deck to give Yuriko triggers that much more effect, but also so we can draw into the cards we want. That brings me to our subtheme (besides top deck manipulation). Dimir is exceptional at a few things. One is theft. Another is Mill. I’m not going to make another mill build since I did that with Tetsuko, so instead I’m going with forced sacrifice since we have a good amount of recursion and can use these tools again and again. So above we have Evil Twin, which isn’t direct theft, but allows you to copy a troublesome creature and then destroy it with its ability. Hostage Taker, Kheru Mind-Eater and Gonti exile opponent’s cards and let you cast them. And then there’s the big three creatures that we want in a sacrifice/recursion environment: Fleshbag Marauder, Merciless Executioner, and Shriekmaw. They can force your opponents to sacrifice a creature, while you’ll just sacrifice it. Shriekmaw is usually just used for its evoke cost and then it’s sacrificed anyway. Bonus, if you have Grave Pact on the board, each time one of your creatures die opponents have to sacrifice another one, so in many cases these are two for one creatures! Keep the board wiped and you won’t need evasion to get your Yuriko triggers! Lastly, let’s look at some of the final cards of the deck, ones that don’t really fit into the other categories. I included Rona because she can do some interesting top deck stuff. You can pay 4 and tap her to exile the top card of your library and you may cast cards that she’s exiled. This means you can manipulate the top of your deck and then do so to get basically another hand of cards you can play at will. Also, when she ETBs she can exile an historic card from your graveyard for you to cast again. My favorite target here would be the lone saga: The Eldest Reborn. Also included are cards like Duskmantle Seer, Sire of Stagnation, Mulldrifter and Coastal Piracy for more card draw. Sower of Discord is an awesome demon that will cause an extra opponent to take damage off of damaging another, and Skull Storm is a finisher in this deck, particularly if you get the storm count up there. That’s all for this brew, but I’m actually rather excited about getting to it! You can see the full decklist here. Which commander did you choose to build around in this deck?